Every business has a document process management burden, and for the most part it is a growing one. Businesses are under increasing pressure to respond more quickly to regulators and there is also a growing need for companies to proactively prepare for electronic discovery. 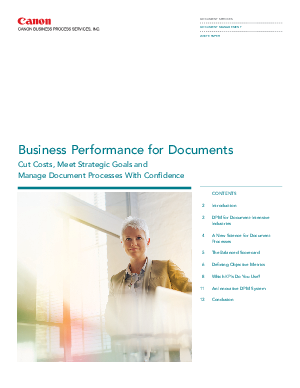 Forward-looking enterprises and business professionals have discovered the use of document performance management to control cost through benchmarking, measurement, management and proactive improvement of document processes in near real time. This paper will explore the potential of applying business performance principles to advance document performance management in a way that enables organizations to reduce costs; better manage documents a vital strategic, financial and information assets; and secure positive return on investment from outsourcing. An example of this approach is MAX, a document performance management system that enables companies to more effectively manage their document processes and outsourcing service providers. In addition, you will learn: how to drive continuous improvement in document process management; how to define objective metrics and identify meaningful Key Performance Indicators; how to implement a balanced score card to meet business objectives and accurately monitor the state of the business; and how to cut costs and improve business results through optimized document process management systems, tools and methodologies. It is recommended that organizations deeply analyze their business processes, extract quantifiable metrics, define key performance indicators, consider the importance of customer, human resources and operational concerns, hold service partners accountable with SLAs, monitor performance in near real time and manage a balanced score card. Learn more on how your firm can aggressively tackle existing deficiencies in your organization’s document management systems.